Not much new content around here lately, huh? Unfortunately, that's the way it's going to be for a little while yet. It's not that I don't have much to say. I have some thoughts sketched out on several Barcelona art spots I've managed to see--the Picasso Museum, the National Museum of Catalunyan Art, and Antoni Gaudi's Parc Güell--but I haven't had the time to do any writing. And I won't for the near future. Until I'm back in blogging action, check out some of the other art blogs listed in the right hand navigation bar. I got an email this week (a sort of whiny one, actually) from a journalist at a national publication that charges for its on-line content. He wanted to make it clear that he was actually the one who broke a story that I linked to at another publication’s (free) site. This example perfectly illustrates the limitations of the paid-content business model and shows why media organizations that charge for their content are ceding their relevance to other providers. In order for content to become part of the broad cultural discussion, it needs to be made available for free, and it needs to remain free over time. Publications like The Wall Street Journal that charge for new content and like The New York Times that charge for access to archived content are sacrificing their long-term cultural relevance for short-term profitability. Before the age of the Internet, the ability to distribute content gave power. The words of a journalist or critic that were backed by the power of an editorial function, a printing press, a fleet of delivery trucks, and a network of distribution outlets dripped with an authority that was conferred by this complex enterprise. With the advent of the Internet, these distribution barriers broke down. Anyone with technical know-how could develop a website and make his thoughts available to the world. With the subsequent development of blogging software, the remaining barriers disappeared. Today, one doesn’t even need to have basic technical skills to publish a website. There is only one barrier to entry remaining for someone who wants to become a voice in the culture at large: the ability to think and write clearly. Granted, that’s still a large barrier, but there have always been more people interested in being journalists and critics than there have been publications to support them. Today one doesn’t need the backing of a major publication to develop a voice and establish a dedicated readership. Today the editorial, printing, and distribution functions have almost no impact on how a writer develops credibility and reaches an audience of readers. Readers are rapidly migrating away from pay-for-use information services (in print or on the web) and turning to free sites hosted by print publications and to other information providers (like bloggers) for current cultural content. Researchers are becoming more reliant on search engine results for information and less reliant on proprietary systems and pay-for-use archives. By hiding their writers behind a curtain that readers must pay to open, mainstream publications are diluting their historical roles in the culture as conveyors of information and tastemakers. Content wants to be free. It’s never truly free to distribute content, although with the Internet the costs have decreased significantly. But as long as mainstream publications continue to charge for their content, their cultural influence and relevance will continue to decline. And their writers will continue to whine that nobody reads them or gives them credit for their work. Carol Vogel has the scoop today in one of her trademark press-release versions of the story: Lisa Dennison has been promoted to director of the Guggenheim's flagship New York museum while Thomas Krens will retain his post as head of the Guggenheim Foundation. What's really different now that these two have new titles? With his expansion lust, I doubt that Krens was really involved in the day-to-day management of the New York museum. Does Dennison actually take on more responsibility and authority with her promotion from deputy director, or is this just an acknowledgement of work she has been doing and an attempt to keep her from jumping to another museum to get a new title? Does this move indicate that the board is trying to exercise power to reign in Krens, or is it actually freeing him from management responsibilities in New York so that he can turn up the gas on his plans for buidling a global footprint for the Guggenheim? I guess we'll have to wait for Vicky Ward and Vanity Fair to get around to providing the real story here. Some readers may not know this, but my wife and I collect on a small scale. We buy a few inexpensive pieces every year, usually when I come across something that intrigues me. I made the decision some time ago not to write about anything in the collection. As readership of the site has grown, I have wanted to avoid the appearance that I’m using it to enhance the value of works I own. But I’m going to make an exception today for three reasons. We recently came to own a piece of art that has no commercial value. My writing about it here can have no impact on the market value of the artist’s work. And the story of how it came into our hands is interesting enough to share. Because I’m on this extended assignment in Europe and won’t have the chance to return home for several weeks, I decided to take Mrs. FtF and the kid with me to Barcelona. Last Wednesday when I returned from the office I noticed a black and white Polaroid on the coffee table in the living room of the apartment we’re renting. It was a portrait of the two of them sitting on the grass in the Parc de la Ciutadella which is a few blocks from where we are staying. I asked Mrs. FtF where she got it. She was walking the baby through the park, she told me, when a woman who had been following them approached and asked if she could take their picture. Thinking that the photographer was someone accosting tourists to make a few Euro, I asked what she paid for it. Nothing, she told me. The photographer gave it to her. I looked at the print more closely and realized that it wasn’t just a snapshot. It’s a nicely composed photograph. The two of them had been thoughtfully posed and framed. Mrs. FtF and the photographer talked before and during the shoot, and the photographer told her that she was traveling to different cities, photographing people who use parks. She had been in New York the week before. She took two test Polaroids of Mrs. FtF and the kid. Then it started to rain, and she decided not to finish the shoot. Her assistant gave Mrs. FtF one of the Polaroids, and they packed up their gear. End of story. Over the weekend, I picked up the map Mrs. FtF has been using to navigate around the city and noticed something written on the back page in a handwriting that I didn’t recognize. When I read the text I did a double take. It was an email address, and there was no mistaking whose it was. I asked Mrs. FtF if the email address belonged to the person who had photographed her earlier in the week. It did. 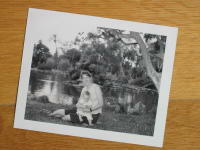 The photographer wrote it there so that Mrs. FtF could stay in touch to find out how the project was progressing. 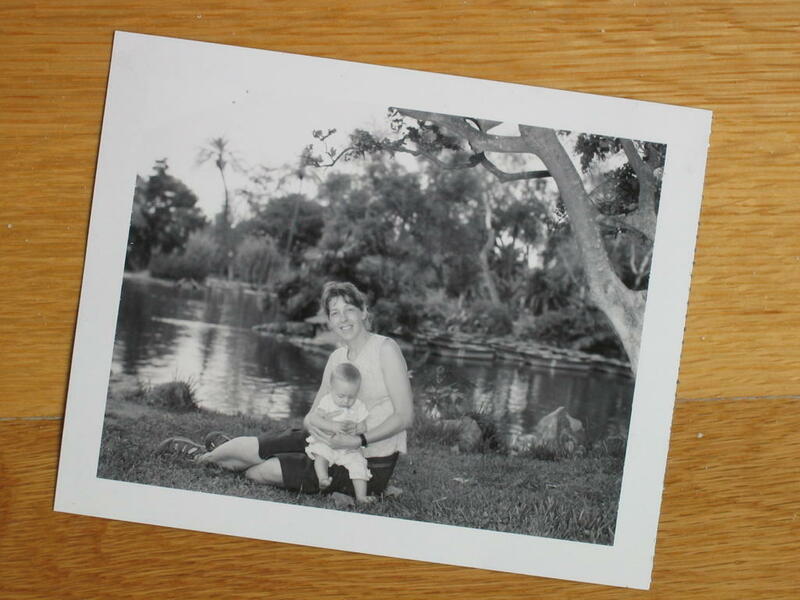 And that’s how I came to realize that we now own an unsigned, 4x6 inch Rineke Dijkstra portrait of the wife and kid. This weekend I also (almost) missed Carol Vogel’s Friday exclusive: the announcement of a date for the Pierre Huyghe extravaganza on the ice rink in Central Park that I mentioned last year. October 20, Vogel reports, is when the fun will occur. I’m afraid I’m going to have to miss that too—much as I had been looking forward to seeing the madness in person. Next weekend I’m going to have to miss a public project in my own neighborhood that looks like it will be interesting. Elaine Gan, a participant in this year’s Bronx Museum AIM 25 program, will be controlling crowd movement through the public space of Sara D. Roosevelt park. There is a simulation of what the piece will look like available here. Browse to the top level of the site to see documentation of several other similar projects. Finally, according to The Art Newspaper, it looks like I missed the chance to invest in ABN-AMRO’s fund of art funds which has been unceremoniously closed down due to lack of market interest. As much as I love the private equity and hedge fund guys, I have to say that I’m glad that the financial markets aren’t quite ready to treat art as just another type of commodity to trade. Hopelessly romantic of me, I know. A trained observer can pick up the sounds of the animal he studies from across great distances. I'm currently 3800 miles away from the east coast of the United States, and I can clearly hear two common calls of the species homo artus: a critic's wail of frustration at being unable to find a mating partner and an alpha-male collector's chest-thumping display of dominance. Saint Peter: Stanley Brouwn, welcome to heaven! Stanley Brouwn: What am I doing here? SP: Well, you were so busy counting how many steps it took you to walk across the city that you didn’t notice that bus speeding down the street. SB: I was afraid that would happen one day. SP: I suppose you know the drill, but let me review the process for you anyway. You’re here at the Pearly Gates. You get one chance to show me what you did with your life, and then I make the decision about whether to open them for you or to send you to that other place. SP: So, I notice that you have a career retrospective on view now at the Museum of Contemporary Art in Barcelona. Are you happy with the show? SB: Yeah, I mean, it pretty much covers what I’ve spent the last 45 years of my life doing—the index cards, the measuring of distances, the stainless steel measuring sticks, the counting of steps. I’m really happy with the show. The curators did a fabulous job installing it, and I think it looks great in the galleries. The show pretty much gives you a complete picture of my life's work. My reputation can rest on it. So you’ve seen the show? SB: I suppose so. OK, then. Go ahead and make your judgment based on that. SP: Are you sure you want me to do that? I mean, a life spent making index cards and measuring distances? That's not much to show, really, for your final accounting. SP: I do. But my records indicate that otherwise you’ve been a pretty good guy. If you ask nicely, I might be willing to give you a mulligan. stanley brouwn is on view through September 25 at the Museu d’Art Contemporani de Barcelona. 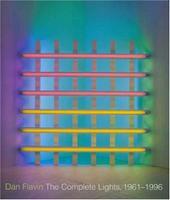 Dan Flavin must have known that he had made his breakthrough with the diagonal of May 25, 1963 (to Constantin Brancusi) (at left) because he decided that one copy wasn’t enough. He specified that the piece be executed with nine different fluorescent tubes (yellow, daylight, cool white, warm white, soft white, blue, green, pink, and red), each one in an edition of three. In this way, Flavin starting playing in the emerging minimalist/conceptualist space. Variability of a single attribute—the color of the light—became for him a consideration worthy of exploring. Flavin had originally intended to vary the positioning of the fixture on the wall as well, but he eventually decided to limit that variable to the 45 degree angle of the initial piece. The catalogue says that two pieces from this series of 27 have never been executed and are (theoretically) still available for purchase from the estate. Interested in buying one of these historically important Flavin works? There is one available in warm white and another in soft white. Of course you could always just buy an eight-foot fixture and the correct bulb from The Home Depot and install it yourself at a 45 degree angle from the floor. But that would be a bootleg, and we could never condone bootlegging art here, could we? The Met has closed the whole wing housing the Robert Lehman collection. I think the closure is due to this post. I think MoMA has finally gotten an atrium installation right. Cy Twombly's The Four Seasons is scaled perfectly for the wall where it has been hung. I think it's going to be difficult (if not impossible) for MoMA to continue to come up with works that harmonize so well with this difficult space. I think the current Matisse show at the Met has been the surprise hit of the summer. Who would have thought that a show about a painter and fabric could be so interesting? I sure didn't. I think somebody totally overpaid when he bought Robert Rauschenberg's Rebus (at right) for MoMA. Sure, it's a great example of Rauschenberg's work from the mid-1950s, but don't you think that for $30M MoMA should gotten a taxidermied animal or two? Too bad it's not kosher to add one at this late date. I think several of the specimens on this site could really complete the piece. I had been thinking that the kid was a budding art critic because I can throw her into the Baby Bjorn and she'll be content to spend an afternoon looking at art. But she was just as happy recently when we spent an hour wandering the aisles of a farm supply store in the Midwest. I'm not sure what to think of her fascination with cowboy hats, DIY veterinary tools, Wrangler jeans, electric fencing, and plumbing fixtures. I think I'm much more happy with MoMA's new fourth floor installation of the Monet painting formerly known as Water Lilies. It's still not shown as well as it was in its old home, but it looks much better in this gallery than it did in the atrium. I think (while I'm on the topic) that nostalgia for the old MoMA isn't necessarily a bad thing. Visiting MoMA now is a much different experience than it used to be, and I think it's healthy that people remember that. Something was lost when MoMA bulked up with its Taniguchi addition and started drawing such monstrous crowds. When I was there last Sunday afternoon I couldn't enjoy anything in the permanent collection because the galleries were simply too crowded. Greg can whine all he wants about people whining about the new MoMA, but here's the fact: it's almost impossible to have a fulfilling art-viewing experience there anymore. 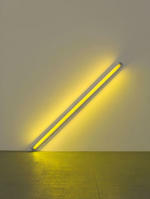 I think I have one more Dan Flavin post left in me after my recent visit to the exhibition in Chicago. I think I'll save it for tomorrow. I think the next few weeks will be somewhat quiet around here. I'm heading overseas for an extended stay. When I'm not working, I'm going to do a little more enjoying of the good life on the Mediterranean coast and a little less blogging. But, then again, I said I was going to take last week off, and the site (for some strange reason) seems to have a post made almost every day. GOD AND GRAPHIC DESIGN My neighborhood mosque, Madina Masjid at Eleventh and First, recently solved one of the great graphic design-based theology problems since the Jews figured out how to spell YHWH. "THERE IS NO GOD" their sign used to read, in foot-high green sans serif type. The second line, much smaller, magenta, and punctuationless, went on, "but allah mohammed is the messenger of allah." The sign's been changed now, but if only more houses of worship would advertise that there is no God, perhaps the world would emerge from its latest dark age. 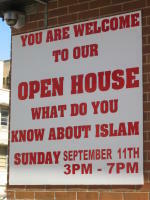 I arrived back home in New York yesterday and passed the mosque while running an errand. Here's a snapshot of a new sign that has gone up there sometime over the last couple weeks while I've been away. 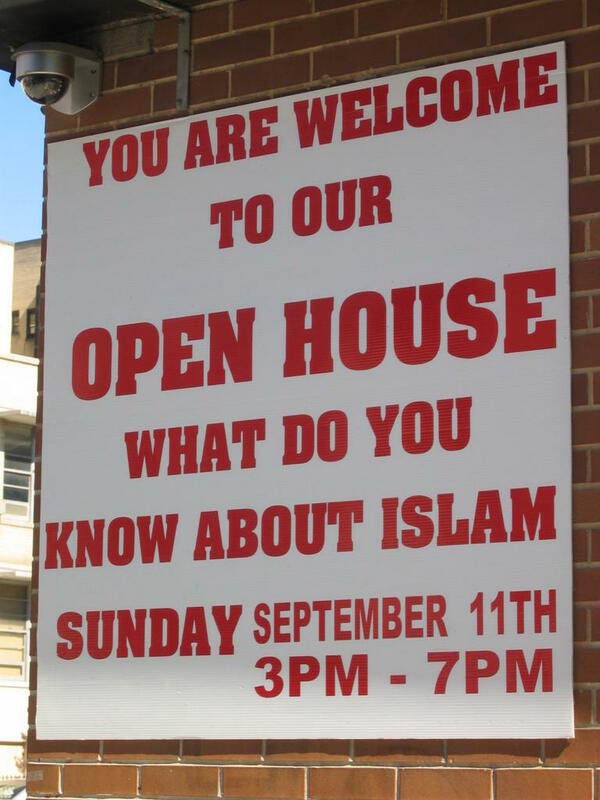 If mosque members would have asked any of their East Village neighbors what the worst possible day of the year would be to hold this event, four out of five respondents would have given this date as their answer. Attendance, I predict, is going to be more spotty than a Damien Hirst dot painting. When I wrote yesterday about Dan Flavin’s progression to simplicity I alluded to the general difficulty any artist faces while working through the process. To the casual viewer, it would appear to be easy for an artist to see into the heart of his or her working process, embrace that core, and then cut back everything but that. In reality, though, this process often takes significant time, effort, and struggle. Included in the Flavin show is a very telling, small work on paper—a poem, actually. When he completed the piece, Flavin dated it at the bottom on the sheet: 10/2/61. The poem has been used on an exhibition website and in gallery brochures, but one fact about it has been overlooked: Flavin wrote this a full year and a half before allowing himself to create a piece that was nothing more than a shimmering fluorescent pole. Somehow, he knew what he wanted to do as early as 1961, but he didn’t allow himself to get there while working in his studio until May of 1963.